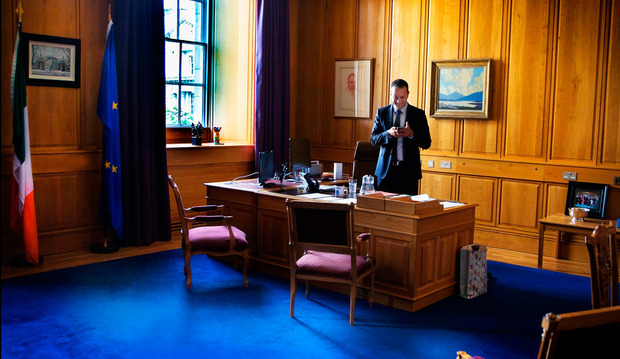 Taoiseach Leo Varadkar in his office in Government Building. Picture By David Conachy. 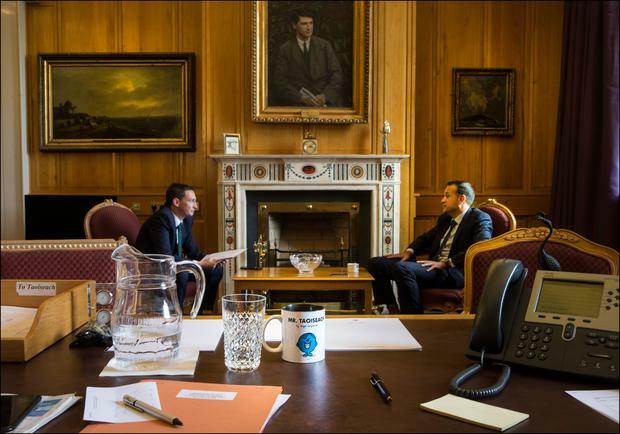 Kevin Doyle with Taoiseach Leo Varadkar in his office in Government Building. Picture By David Conachy. As Taoiseach, Enda Kenny operated a revolving mantelpiece in his office, often changing the photographs on display depending on which international politician was in town. "Too much effort" is the blunt reply from the new incumbent as he gives a very brief outline of his plans for the famous room in Government Buildings. For all the talk about style over substance, Leo Varadkar has no intention of changing the curtains or filling the place with personal effects. A single picture of him with his family in Aras an Uachtarain sits on a table, waiting to be hung. 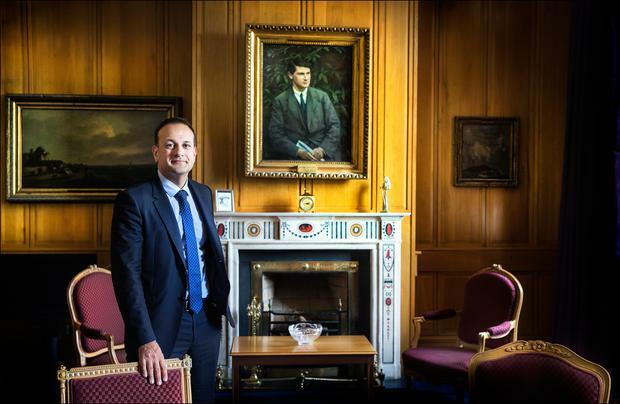 He has kept the portrait of Michael Collins over the fireplace and, perhaps in a nod to his administration's 'confidence and supply' arrangement, the 38-year-old has added one of "moderniser" Sean Lemass to the wall behind his desk. There's also a painting by Paul Henry called Into The West which was a favourite of his predecessor. 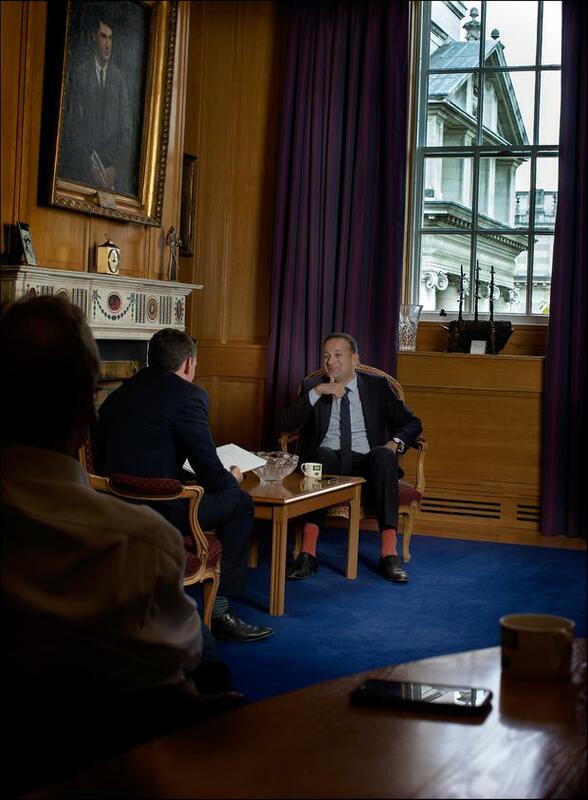 "That's there to remind me that I'm Taoiseach for the whole country," he says, before sitting down for his first in-depth interview as leader. His first month has proven to be a steep learning curve, marked by controversy over judicial appointments and the Jobstown trial. And while there have been plenty of light moments, most notably his day of fun with Canadian Prime Minister Justin Trudeau, the Taoiseach gives the appearance of a man distracted by an ever-growing schedule. As the Dail headed for its summer break, top of the Government agenda is the budget. A day prior to our meeting, Finance Minister Paschal Donohoe played down expectations, warning there is only €300m available for tax cuts and new spending. Mr Varadkar paints a more positive outlook, explaining that they have ways of "expanding" that figure. "It's going to be tight. Any spending increases and tax cuts are going to be modest. But it'll be more than €300m," he says. "For example, if unemployment continues to fall, and we anticipate it will, there will be savings in jobseekers' allowance. There's also the possibility of revenue-raising measures. It's pretty normal in budgets now to put 10 or 20 or even 50 cents on cigarettes and that brings in revenue too." That, Mr Varadkar believes, will give him room "to reward work and reward enterprise through targeted but modest tax reductions". He says the "big story for 2018 when people look at it historically will be the fact that we balance the books for the first time since 2007. For the first time in 11 years, Ireland will balance the books and will continue to reduce our debt. That's the most important thing." At the same time, he accepts that his Fine Gael leadership campaign has created an expectation among people who get up early in the morning. "We have two million people in the country now at work. Some 1.5 million of those pay income tax and USC. Because of their work and the taxes they pay, it makes everything else possible and affordable in this State. It's important to reward work and support enterprise. "That's why I think we will find some space to have a tax package to reduce taxes on Middle Ireland. What we may need to do, though, is set it out over two or three years so that people can have a bit of certainty about their incomes. "The fact people have a bit of money in their pockets is important, too, because that will drive domestic demand and create jobs in itself. People will see their payslips improve and their incomes rise." So on Budget Day in October, we can expect a multi-annual tax plan - which sounds a lot like electioneering, given that the deal with Fianna Fail is up for review in late 2018. Not the case, says the Taoiseach. It's about showing people that there is a "prudent and responsible" way to "put money back in people's pockets and start to show real progress in areas like housing and health". According to the Summer Economic Statement, there could be in the region of €3bn of so-called 'fiscal space' for 2019, raising the question as to why Fianna Fail would prop up the Government long enough to allow Mr Varadkar a giveaway budget. "That's ultimately going to be a decision for them," he says. "The focus of the Government is going to be on doing a good job. And I think if we demonstrate to the public that we're doing a good job, we will stay ahead in the opinion polls. Why would Fianna Fail cause an election if they are behind in the polls?" Having said that, Fine Gael has begun planning for a general election. Since taking office, Mr Varadkar has met with key party staff to discuss their strategy and his diary now includes monthly forums to get updates from ministers, the head of the Seanad, the party chairman and the head of Fine Gael's executive council. "I'm not planning an election but I think it would be remiss of any political party not to be prepared for one if one was to occur," he admits, adding: "I won't be doing a Theresa May, you can be sure of that." Last year's election should have been a home run for Fine Gael but the 'Keep The Recovery Going' campaign fell dramatically flat, in no small part due to the debacle over water charges. At Easter, a deal was done to end the regime and a promise made to give almost one million households their money back. Families are due up to €325 but Paschal Donohoe has been unable to give a timeline for when they can expect what is rightly theirs. Now Mr Varadkar has told the Sunday Independent that everybody will definitely have a refund in time for Christmas, possibly much sooner. The Government is still in talks with the European Commission and Irish Water about how to fund and administer the money-back scheme - but the Taoiseach promised: "They'll be refunded this autumn. We're gearing up to do that." He suggests the €170m needed will not come out of the money allocated for Budget 2018, saying payments will start before the budget is even announced. "We'll do it and have it under way. I anticipate that everybody will have their money back before the end of the year." If he can follow through on his promise, then what former Finance Minister Michael Noonan once described as a "dead cat" will finally be taken off the pitch. At the same time, it will mark a victory for protesters like Solidarity TD Paul Murphy, who claims Mr Varadkar accused him of "thuggery" in the Dail last week. Mr Murphy, who was cleared of falsely imprisoning former Tanaiste Joan Burton after a nine-week trial, has accused the Taoiseach of defaming him - but Mr Varadkar says his words were carefully chosen. "I think it was important to state for the Dail and the public that while he and the other people involved in that protest, and who led that protest, might not be guilty of the crime with which they were charged, none of us in politics should condone that sort of behaviour." He refuses to say whether he believes Mr Murphy should have been charged with a different offence than false imprisonment, which can carry a sentence of up to life in jail. Yet he doubles down on his criticism of what happened in Jobstown. "People can disagree on issues but there's a way we should conduct ourselves. Surrounding somebody's car, hurling abuse at them, calling them names, throwing things at them is not acceptable in my view," he says. "There's two separate issues. There's the conduct of the protest which I condemned unreservedly. And then there's the whole issue of prosecutions being unsuccessful. Prosecutions, whether it's this case or the Sean FitzPatrick trial, cost a lot of taxpayers' money and take a lot of time for people. I think it's reasonable for the head of Government to express a concern held by a lot of the public that prosecutions aren't always taken to the highest standard." And Mr Varadkar again called for those involved in the protest to offer his constituency rival an apology. "I think anyone who was involved in violent behaviour - and there was violence - you can see that from a water balloon being thrown in somebody's face. Anybody who was involved in using terms of abuse about women, the likes of which were used. I think anybody who's involved in that sort of conduct should apologise for their behaviour. That's no way to conduct debate in this country." The Taoiseach met with Garda Commissioner Noirin O'Sullivan for over an hour-and-a-half last Wednesday but declined to say whether he raised his concerns about the garda evidence during the Jobstown trial directly with her. He did tell the embattled police chief that he will continue the Government's defence of her work, even advising her to "take on" those within the force who might be obstructing reform. "I reassured her again that she has my full support, that she has the confidence of the Government, and I said to her that if she's facing resistance, if there are people in the gardai who are resisting reform, who are resisting culture change, who are not willing to engage in the kind of reform that's required in the gardai, that she should take them on and she'll be backed up if she does so," Mr Varadkar said. The Taoiseach told Simon Harris something similar when they met recently. Relations between the pair became extremely strained when the Health Minister became the only Cabinet minister to support Simon Coveney in the leadership contest. It was widely reported that Mr Varadkar thought long and hard about sacking the young gun from Cabinet but decided against such a move after a plea from Mr Coveney. Has the bad blood washed away now? "Yeah, I think so. All these things tend to be exaggerated, anyway. I'd read these things in the papers about there being a terrible feud between us. It was never like that. "We were on different sides in the leadership contest. I think since then we've had a very good relationship. I want him to succeed. It's very important for the success of the Government that we make progress in health." Mr Varadkar has sent his RSVP and will be at the Wicklow TD's wedding later this month. He says he wants them to work closely together now because, while the Department of Health has a record budget, the public isn't seeing the benefits. "I think the first thing we need to do is change the idea that always adding more staff and more money to a system that isn't delivering is the solution. I'm really focused on what is required, which is much better management and greater clinical leadership," Mr Varadkar says. The former doctor "broadly" supports the 10-year plan set out by a cross-party Oireachtas committee, including the separation of public and private practice and a slimmed-down national body to replace the HSE. He "imagines" there'll be progress next year on extending free GP care, although it's likely to be done by changing thresholds rather than in a universal fashion. "It's not decided how we're going to expand free GP access next year. But one of the things we may do, it would certainly be the easiest thing to do, would be to do it around the income limits. We can do that within the existing contract [with GPs]. We've already indicated we're going to raise income limits for people on disability allowance. "We could do that more generally and bring more families on low incomes into the free GP care net." Alongside health, housing is the other big area where the Government is struggling to show progress. "I am concerned about the rise in property prices, particularly for people who want to buy a home for the first time. Even people in my age group, in their late 30s, haven't bought properties yet. People used to often buy in their 20s. Because of the recession, we now have a lot of people in their late 20s and 30s who are renting and would like to buy. We're nowhere near the kind of property prices we had at the peak, even with the rises that have happened. We're still roughly 30pc behind the peak. But we don't want to go back there," he says. The Taoiseach notes that prices did "moderate", but are now rising again. He reckons some of that may be down to the loosening of Central Bank mortgage rules but also has a "real concern" that Simon Coveney's first-time buyers' grant may be partly responsible. "So we do need to look at that and see to what extent they have impacted on house prices." For people already with homes, he has one eye cast towards the revaluations which will take place next year on property taxes. With prices rising substantially, households are bound to get an increased bill - but not perhaps by as much as they would expect. "Some people, particularly in the cities, will see a very dramatic increase in their property tax. I don't think that should happen. I don't think people should be facing 40, 50, 60pc increases all of a sudden. "The most obvious way to alleviate that and make sure it doesn't happen is to give local authorities more flexibility to vary property tax. At the moment, they can vary it up or down by 15pc. You could allow them much more power to vary property tax and not to take the windfall. That will prove popular with 'Middle Ireland', whom Mr Varadkar has set as his target audience. He says his election as Taoiseach did lead to a 'Leo leap' but perhaps not the one people expected. "Before Enda announced that he was going to step down, we were behind Fianna Fail in the polls. Now we're ahead. That's where I intend to keep us for lots of different reasons. There was never going to be a second bounce. I think some people hoped there was going to be a double bounce,'' he says. So what about the accusations that the newly minted Taoiseach puts style ahead of substance? 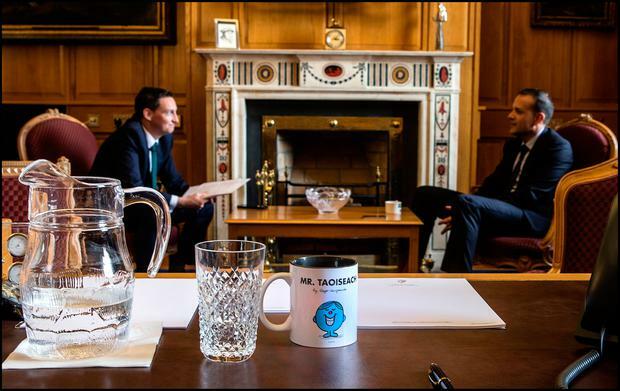 A 'Mr Taoiseach' mug on his desk could be added to the list of quirky Varadkar stories - but he's happy to point out it was actually left for him by Mr Kenny. "It doesn't bother me much. I see it as a little bit of a compliment that people think I have style. So I don't take any offence from that. "It's my duty now to prove over the coming months that I have substance as well. I hope I can prove that by bringing a budget through that makes people better off and provides more money for services. There'll be some really tough decisions and political calls to be made in the second half of this year." Aside from the budget, his 'to do list' includes a new capital plan, Brexit negotiations and Northern Ireland. "I would intend over the next six months to demonstrate real substance and real progress in all those areas. And then perhaps people will be talking about the good substance as well as style."